Let’s Train your Dog! - You change and your dog will change! Guaranteed! Is Your Dog Stealing Your Car? 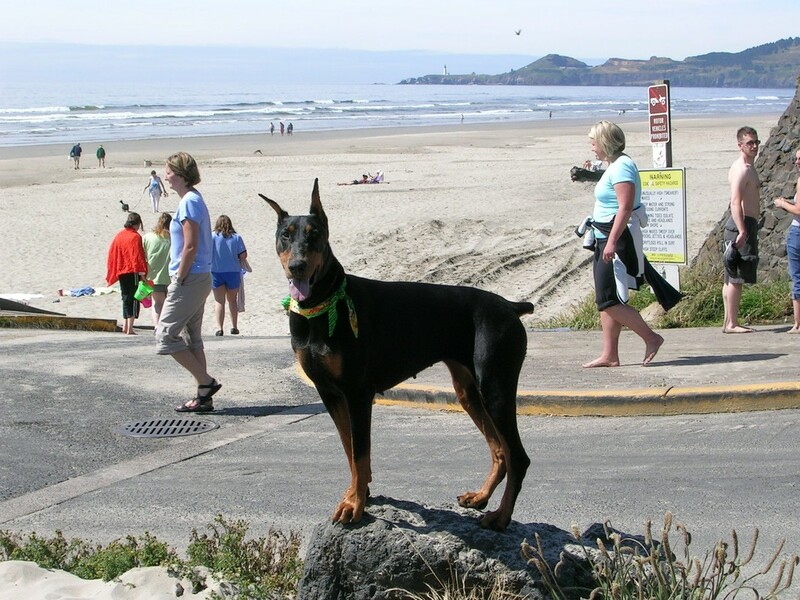 My girl, Jetta (gone now) at the beach in Newport, OR. to enter my ​raffle for a free lesson! I can train you anywhere in the US. Is your kid making you crazy? I would LOVE to help you turn your "Little Devil" into an ANGEL. relate to and LIVE with your dog. (They are non-forceful; I do not bully, scare or manhandle dogs. In fact, in my lessons, I rarely even use a leash.) These methods build a dog’s confidence and maintain his spirit, enthusiasm and trust. I say I am a dog trainer, but truthfully, I don’t really train dogs, I train people. 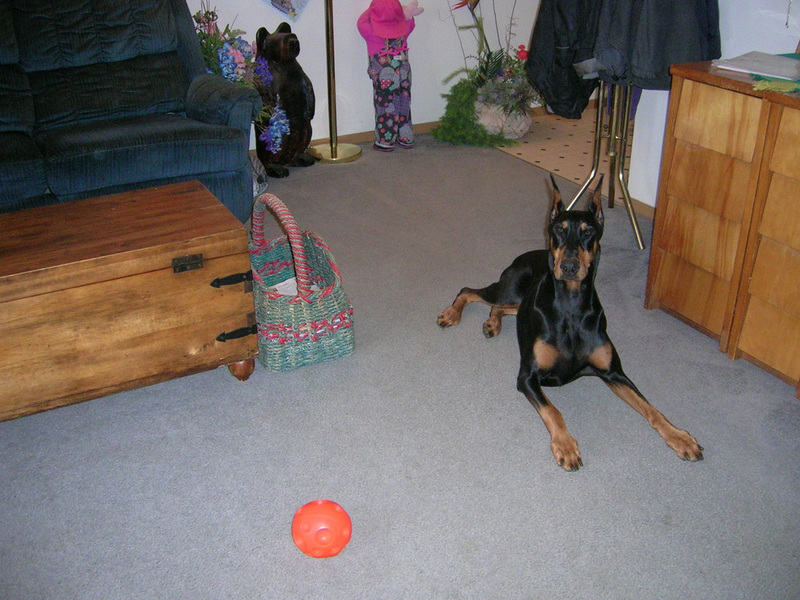 I conduct in-home private dog training lessons in which I teach my students how to train dogs. This means they can train their dog, and all the dogs they have after that. They will NEVER again have an untrained dog! Then I teach the owners how to be the leaders. Forget the old-fashioned concept about being the “alpha” and forcing the dog to be “submissive.” It’s all about leadership, a quiet nurturing strength. I also teach students about management. You must manage a dog until he is trained. Without proper management, you cannot be consistent, which is absolutely vital to effect change. And I cover exercise, the most-neglected need dogs have. Dogs need to run! It’s hard to train a dog who is not exercised and it’s hard to (properly) exercise a dog who is not trained. I have 18 ideas on how to run a dog who cannot be trusted off leash. Finally, I teach my students HOW DOGS LEARN. I do not teach them or their dogs any “mechanical” behaviors. Regardless, at the end of the lesson, I ask my students: “Do you now know how to teach your dog heel, sit, down, stay, come, wait, look at me and go to bed?” They ALWAYS say "yes." You cannot learn all of this in a group class, nor can you (or your dog) focus in a group setting like you can privately, and in your own home. ​then go PRACTICE outside where it's harder. When you have a calm dog looking for direction, and you are the leader, and you properly exercise and manage him and you implement principles and techniques to help him learn… it all falls into place. You have a polite dog seeking your direction and you can teach him almost anything you want. Some students’ dogs have issues not specifically covered in this lesson, and they MAY (or may not) need some extra help. My lesson, which settles dogs, builds their confidence and strengthens their relationships with their owners, is a MUST before attempting behavior modification for aggression (dog-to-dog aggression or aggression toward humans or other animals), separation anxiety (or generalized anxiety), or fearfulness and is a vital tool for puppy crate training and housetraining puppies and older dogs. It also addresses (and usually cures) common problems like barking, digging, chewing, jumping, terrorizing the cat, going crazy with guests, charging out doors, and just being plain ‘ol pushy and demanding. If your dog runs the show in your home, we can change that almost overnight! It’s almost never the dog. It’s almost always the owner. Calm attention means, "I want more!" Jetta is “asking” for more food in her “Tricky Treats” ball. ​We teach dogs to calm themselves and ask permission for what they want. The best place to train your dog is in a quiet, familiar environment (your home)! Later, with some training under his collar, work with him (using what I teach you) in more stimulating environments, like out in public or when you have guests. ​I come to your Northern Oregon or Southern Washington home for about 3 hours, where you and I teach your dog to calm himself, even in exciting situations, then you and I finish by phone for about an hour one day and an hour to an hour and a half a second day, where I teach you the academic stuff. ​This lesson is HUGE (a student once commented that "You get a lot of bank for your buck") and you are done in THREE DAYS! Testimonials: ​"Holy Cow! What spell did you cast on Josie? Totally different dog..."
Remember: Bigger, Faster and More Effective Than ANY Group Class! ​This is the same exact lesson, and again, done in your home (the BEST place to train your dog). It is the same time commitment as above but with a lot more flexibility. This is great for students who live too far away for me to go to their homes. ​It’s also great for dogs who are aggressive with, or fearful of, strangers. (Never stress out your dog.) Dogs cannot calm themselves and learn when they are stressed out or scared. (Can you?) I work with these dogs by phone so they are relaxed. We will work together by phone (and Skype if necessary) for 5-6 days. Buster did my lesson by phone. Mom Debbie says, "I am still amazed at how easy it was! 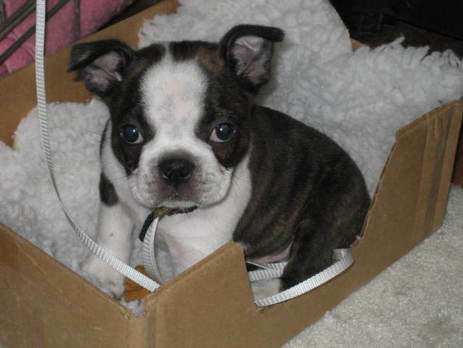 Buster was only 8 weeks old. Victoria's extreme confidence and excellent coaching ability made the lessons easy to understand and go very smoothly. ​It's a joy to have such a calm and willing puppy." ​Yes, Yes... Bigger, Faster and More Effective Than ANY Group Class! "Baby Steps" is not just a dog training book! 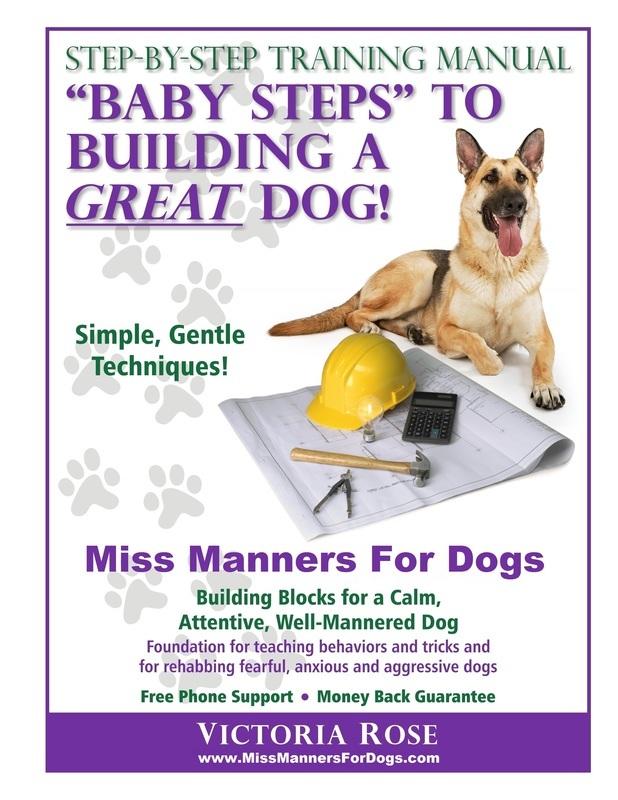 ​It is my Step-by-Step guide, walking you through my lesson WHILE YOU WORK WITH YOUR DOG. ​ a recipe while cooking. AND a money-back guarantee. It's the same lesson as above, and again, done in your home (of course), the best place to train your dog. The manual (which you return to me after the lesson), enables you to save money by working on your own. Most students can do the whole lesson in an hour a day for 8-9 days. ​Like reading a recipe while cooking. Very few students ever call me for help. I am a writer and former newspaper reporter (including two years as a stringer for San Jose Mercury News), and students say the manual is very well-written, simple, understandable and easy to follow. If all this fails... I will refund your money, plus any mailing fees. (This has happened only once.) It won’t cost you a penny and you will have learned a lot in the process! Remember: ​This lesson is HUGE and you are done in TWO WEEKS OR LESS! ​No matter how you take my lesson, I guarantee you will understand my lesson and that you and your dog can perform all the tasks or you don't pay. This has happened only twice in-home, twice by phone and once with my "Baby Steps" manual. After the lesson, I am there for you, free of charge, for any clarification or coaching you need on any material covered in my lesson. Your satisfaction and success are important to me. I will also meet with you again, at no charge, if necessary. I want you and your dog to be successful and to be able to use what I teach you!